Leading global provider of 3D printing and additive manufacturing solutions Stratasys has announced that it has joined the PTC® PartnerAdvantage™ Program at the Platinum Tier to increase accessibility and enhance design for additive manufacturing. 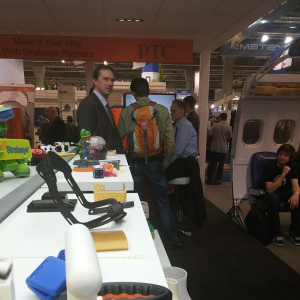 According to the media release by Stratasys, the two companies will take part in joint technical, educational and go-to-market activities that will increase the synergy and accessibility between PTC’s design software and Stratasys’ complete line of 3D printing solutions. The aim is to create integrated, collaborative solutions that enable PTC Creo® design software users to optimise their designs and streamline workflows for Stratasys 3D printing solutions. “PTC is excited about collaborating with Stratasys to help transform the way our joint customers create great products. Our shared vision will not only support our customers as they embrace additive manufacturing but also allow them to exploit new technologies. Collaborating with Stratasys allows us to accelerate our ability to help customers create stronger, lighter, more differentiated products by truly optimising their designs for 3D printing,” said Michael Campbell, Executive Vice President – CAD Segment, PTC Inc.
“Working closely with our customers has shown us that there is a gap between design software programs and additive manufacturing technologies, which we are now bridging through key industry partnerships. We are therefore pleased to announce this collaboration between two industry leaders, which is designed to create a streamlined experience between PTC and Stratasys solutions. The tools and knowledge we will provide are aimed to allow our customers to save significant time, effort and resources throughout their design and manufacturing cycle and improve the quality of the final products,” said Dan Yalon, Executive VP of Business Development, Marketing and Vertical Solutions at Stratasys. With PTC Inc., manufacturers are able to achieve a sustained product and service advantage. The PTC PartnerAdvantage Program is PTC’s technology partner program for complementary hardware and software companies. PTC collaborates with over 28,000 businesses around the world assisting them to design and service products in rapidly-evolving, globally distributed manufacturing industries, including industrial equipment, automotive, high tech and electronics, aerospace and defence, retail, consumer, and medical devices.